The city of Ávila is one of the locals’ favorite place to visit in a weekend. It is only one hour away from Madrid. The magnificent Romanesque walls, the impressible heritage buildings and the amazing food created an offer difficult to regret. The easiest way to visit Ávila is to book a day tour. 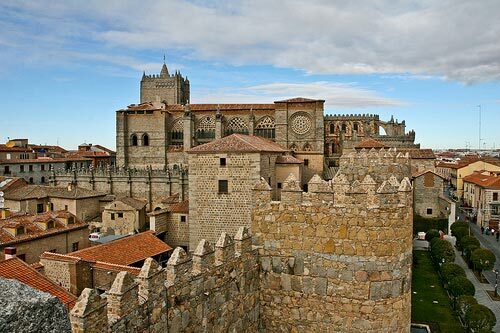 Avila and Segovia Full day includes a private guide in English to visit both cities. It departs every day at 9.00 am from Plaza de Oriente. The Ávila Walls together with the inner city and the outside churches has been declare World Heritage Site by the UNESCO. This incredible monuments dates from the Middle Ages, more exactly from the XI century. The walls surrounds completely the city enclosing an area of 33 ha. It also includes 87 towers, and 9 gates. The walls are mainly 40 feet high and the tower arrive to 65 feet high. The walls have a path on the inside upper part that allows the people visit them and walk around the whole city at the same time. They have three different access, but the main one are in the Puerta del Alcazar or Castle Gate. On the outside the walls has become a park. The green area that separated the walls from the street surrounding the city, are the perfect place to walk around the city and visit their main monuments. The inner city constructions in Ávila also show their defensive structure. Probably the most illustrative example will be the Cathedral, which structure combines an amazing gothic temple with a Romanesque fortress. The Ávila Cathedral was the first gothic church built in Spain. Its peculiar apse built in the XII century is called by the locals Cimorro, regarding its defensive character. The cathedral inside is mainly decorated with pieces from the XV and XVI, including the main altar by Pedro Berruguete. Outside the walls and through the Gate of Saint Vincent stands the magnificent San Vicente Church. Tradition situates this as a historical place for the Christianity, since this is where the martyrdom of Saint Vincent, Saint Sabina and Saint Cristeta took place. The church started to be built in 1120, but wasn’t completely finished until the XIII century. It is surrounded by an arcade gallery that was added later in the XV century. In the inside the Madonna of La Soterraña is the most important virgin image in the area. It was venerated by Teresa of Ávila. Regarding the emblematic figure of Teresa of Ávila, the city turned The Monastery of La Encarnación into a museum on her honor. One of the most interesting pieces in the museum is a drawing of Christ on the Cross by St John of the Cross. This monastery was founded in 1478 and was probably the most popular in Castile during the XVI century. Besides the enormous amount of church to visit in Avila and the walls, there are several palaces and museum that worth to stop, like Palace of los Verdugo and Palace of los Serrano -refurbished as the Cultural Centre.